So, you are ready to soak in the supreme effort of the world's best athletes, eager to watch on your TV set their four years and more of intense preparation tested on the greatest stage—the Olympic Games. When the games begin in Beijing on August 8, dreams will be realised or shattered amidst a welter of emotions. You may feel a strange detachment, wonder why some of the medals do not come India's way. And you may hear once again that hopeless lament: "A billion and more Indians and yet...." Indeed, time was when our athletes felt satisfied in merely having qualified for the Olympics, leaving the medal-taking to other nations. But since Leander Paes won a bronze in 1996, breaking a long jinx, there has been a change in attitude. Four years later, weightlifter Karnam Malleswari brought home a bronze from Sydney. Then double-trap shooter Rajyavardhan Rathore was on target with a silver in the 2004 Olympics in Athens. And now, in 2008, there's a realistic chance that India could return from Beijing with more than one individual medal. If this has happened, it's because of both government support and private effort. The Mittal Champions Trust, for instance, has supported 13 sportspersons on their journey to Beijing. And Olympic Gold Quest, promoted by sporting legends Prakash Padukone and Geet Sethi, has helped ace shooter Gagan Narang. There's reason for the growing hope: Narang has been in good form, setting a new world record a few weeks ago in a pre-Olympic competition in Hanover; pugilist Vijender Singh stunned the boxing world recently with an upset vic- tory over Athens Olympic Games best boxer Bakhtiyar Artayev (Kazakhstan) in the 75 kg category at the aiba President's Cup tournament in Taipei; the women archers—especially Laishram Bombayla Devi—have stoked hopes with fine performances; Mahesh Bhupathi, with Leander Paes and Sania Mirza for company, will remain sentimental favourites for tennis medals. 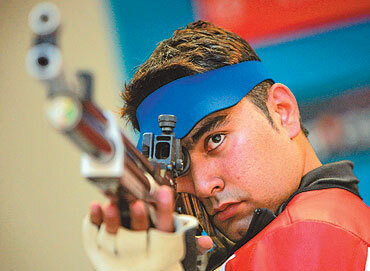 "Every one of us who has qualified will be going there with the hope of bagging a medal," says 23-year-old Gagan Narang. "But it all comes down to the day of the competition. Whoever strikes the right chord, walks into the range in perfect mental and physical state, will walk away with laurels." There are as many as nine Indian shooters at the Olympics, but Narang is the only one to win a medal on the world stage this year, having claimed a bronze at the World Cup in Beijing. His world record 704.3-point effort in Hanover in July is a demonstration of his fine preparation and ability to perform under the stress of world-level competition. "By any standard, this is a wonderful performance. I feel it might take a lot of time before anyone can break this record," says national shooting coach Sunny Thomas. "However, there is a lot of difference between shooting a high score in a training session and doing that in a competition, that too with some of the best shooters in the world. But I'm sure Hanover will boost his confidence." Narang himself says that the score of 599 in the qualification round at Hanover gave him a lot of confidence. "Shooting 599 itself at any competition is immensely satisfying and it is an indicator of current form. My aim is to shoot consistent scores and if I am able to achieve that, the rest will follow," he says. His colleague and 10-metre air rifle rival Abhinav Bindra has not had much to show after the World Championship in 2006 but can be expected to make that big push on the Olympic stage. Four of India's five boxers at the Beijing Games are from Bhiwani Boxing Club in Haryana. If the draw does not pit them against tough opponents in the early rounds, Vijender Singh and Akhil Kumar are among those who can reach out for the medals. "What else do I want? I am the happiest person on earth and am waiting for them to win the country's first Olympic boxing medals," says their club coach Jagdish Singh. Ageing tennis maestros Leander Paes and Mahesh Bhupathi will remain Ind-ian favourites for a gold, notwithstanding their squabbles off the court. Their fans will hope that Lee-Hesh will rediscover the on-court chemistry that made them household names in India in 1999. When they finally came together for a pre-Olympic competition—the Ordina Open last month in the Netherlands— they did reach the final. It was a shock that the men's team did not qualify for the archery competition. It was left to Mangal Singh Champia to qualify when he got silver in the Asian Championship. He could still mount a challenge but India will have to bank on its women archers to deliver the goods. National champion Laishram Bombayla Devi, Dola Banerjee and Vardeneni Pranitha have the potential to power India to the final of the team event. So next time you hear the lament, "A billion Indians and yet...#", you may well say, "One of them might finally just make it count." Beijing beckons.